I finally got some semi decent shots of Harlequin Ducks (in my 3rd winter of trying). This male was one of a group of 20 or so near Menagwa. I even had to clamber over slippery rocks in a rare display of athleticism. 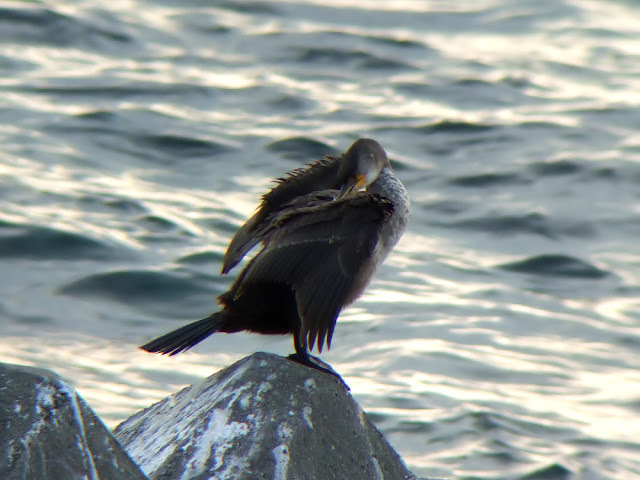 The background is not so nice.......these tetrapods are everywhere in coastal Japan. 'Defence' against typhoons and tsunamis apparently. The duck I got closest to seemed to be missing 1 wing. I hope this was just because the bird was in mid-moult. We were in Menagwa looking for an extremely rare bird. A Siberian White Crane. A friend of my wife's contacted here to say she'd seen a picture in the local paper yeasterday of said bird at Menagawa. We'd actually been in Menagawa on Sunday. So we drove over to the place it was seen. Of course the bird was no longer there (we later discovered it had left on Sunday morning whilst I was sleeping off a hangover). Lots of Salmon (alive, dying and already dead) in the river. Fishermen aren't allowed to catch them within a certain distance of the river mouth so the coastline is dotted with little coves and beaches with men fishing for the salmon. Looks like I'll have to practice a bit more with that then. the 'pool did ok lately. 10 goals in 2 games. Pity they couldn't have spread those euro goals out a bit more though over the 3 previous games. I seem to be missing lots this autumn! My footballing thoughts are preoccupied with the national side at the moment. Being an Irishman you're spared the torture of supporting England. I'm jealous. But at least Liverpool seem to have turned a corner.